Related articles: Capricorn and Capricorn – Pueblo Bonito in New Mexico, Acoma Pubelo: Scorpio with Aries as the constellation of strongholds, Aquarius as the corresponding sign of Maya culture, Pisces and Pisces – The Mahabodhi Tree in Bodh Gaya, Pisces and Capricorn – The Temple of the Eleusinian Mysteries, Pisces and Pisces – Glastonbury Abbey, Lincoln Memorial & Temple in Pisces. 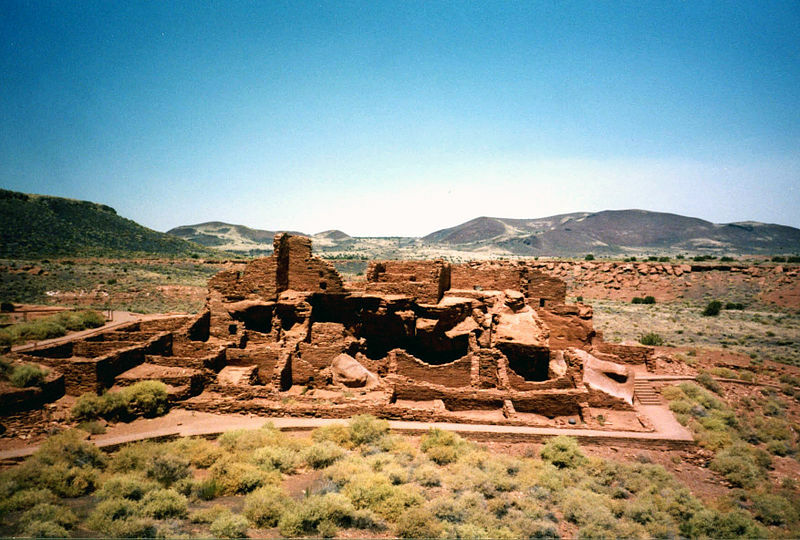 The largest buildings of Wupatki National Monument in Arizona was the largest building in the US before the construction of Pueblo Bonito between 850-1150 AD. Both structures were built by the Pueblo people. 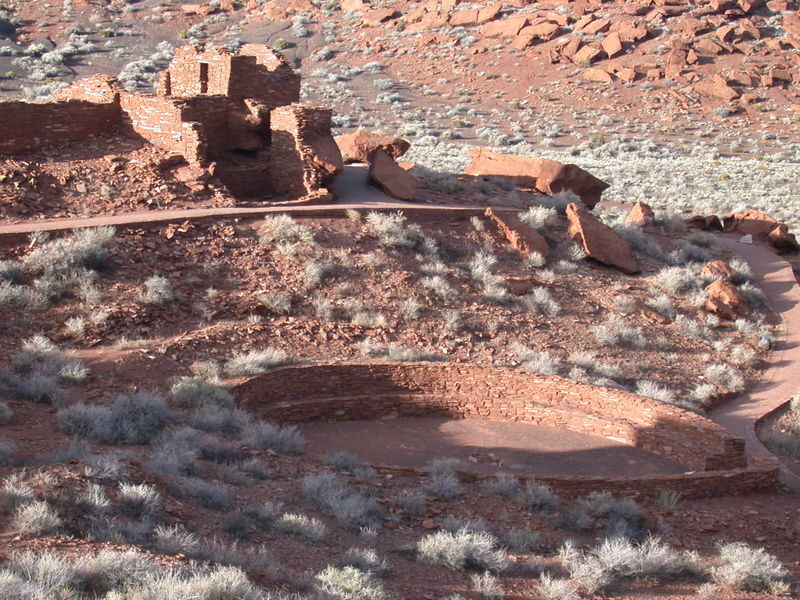 The Wupatki site area was inhabited from around 500 AD until early 13th century. The largest building here was a 40 x 20 m large structure. Astrogeographic position of the largest buidling of the Wupatki National Monument for morphogenetic field level 4 (exact position) which describes the building itself: both coordinates are in highly imaginative, relaxed, mystic, spiritual water sign Pisces sign of spirituality, dreaming, reconnection, hiding, the otherworld, temples, entertainment, intoxication, music, holidays and of letting go. Pisces could point at seeking shade and shelter from the weather and of course at the function as a temple site. The Pisces element does not reflect the functions as a town center like for storing food, exchange of goods, administrational purposes, a military center nor the fortress character of the buildings. What Pisces does suggest is the function as a gathering site for spiritual festivities or any type of celebration possibly including intoxication as in the case of the site of the Eleusinian Mysteries located in Pisces-Capricorn. Or else a site of leisure, entertainment, festivals and/or music with a natural resonance for doing things without practical purpose other than stimulation of imagination, dreaming, mystification and reconnection with the spiritual plane. Finding both coordinates in Pisces is really surprising for such a long living and outstanding building because of the expectable instability of structures that the sign would normally suggest. If we imagine that people weren`t used to sharing such large buildings those days the Pisces impact may have supported the development of a mentality that helped the social goup develop their culture of cohabitation. The Pisces mentality can stimulate acceptance and the readiness to not take things too personal. Astrogeographic position of the surrounding area of the two larger buidlings and the ball court at Wupatki National Monument for morphogenetic field level 3 (surrounding area) which describes the building itself: the longitude coordinate for this part of the Wupatki settlement is located on the last degrees of highly centralistic, magnetic fire sign Leo also known as the royal degrees pointing at the possible function of the buildings as the seat of the tribal chief and court. This would also explain the relaxed, mystical atmosphere of this part of the settlement. The coordinate for the astrogeographical latitude lies on the last degrees ín Pisces the energetical qualities of which are more than doubled because of the strong resonance of the main buildings with that sign for field level 4. The combination of Leo with Pisces here is a clearest hint at the function of the site as a place to be related to a royal court and kind of a capital.